France is cracking down on terror after a sting operation on an Islamist terrorist cell netted 11 arrests. One suspect was killed. France is cracking down on terror after a sting operation in connection with an attack on a Jewish supermarket left one dead and 11 arrested. The statement came following a "vast anti-terrorist operation" Saturday night in which police killed 33-year-old Jeremy-Lous Sidney, a convert to Islam in a raid in the northeastern city of Strasbourg, and arrested 11 other suspects linked to a radical Islamist terrorist cell. Hollande gave no details on the organization, but said the group had “struck in the past” and that officials had believed it “could stage attacks in the coming weeks.” The detainees were all in their 20s and 30s, according to Paris prosecutor Francoid Molins, who said that some were “common criminals who set out on a path of radicalization toward Islamist jihadism,” AFP reported. Within hours of Sidney's death, blank shots were fired at a synagogue in the Paris suburb of Argenteuil. Jewish leaders asked officials to beef up security around its neighborhoods, and services at the synagogue for Sukkot were canceled. 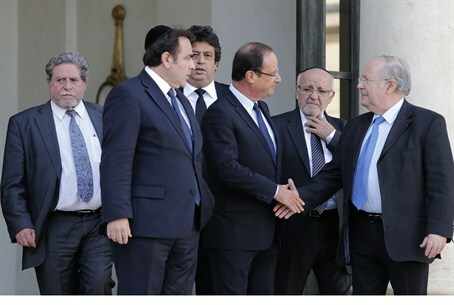 Richard Pasquier, President of the Representative Council of France's Jewish Associations (CRIF), and Jewish central Consistory President Joel Mergui met with reporters together with the heads of France's Jewish Associations at a news conference on the steps of the Elysee Palace, after their meeting with the French president. Hollande also met with reporters at the palace and emphasized,“The state is totally mobilized to fight all terror threats.... planned anti-terror laws will be put before parliament as soon as possible,” according to AFP.